Like many college students, a Saint Ursula student takes four classes at a time. The collegiate block schedule provides four class periods per day (typically, 80 minutes) – sufficient time to stimulate and develop thought and discussion, to write an in-class essay independently, to work cooperatively in solving a math problem, or to complete a science laboratory session with a partner. 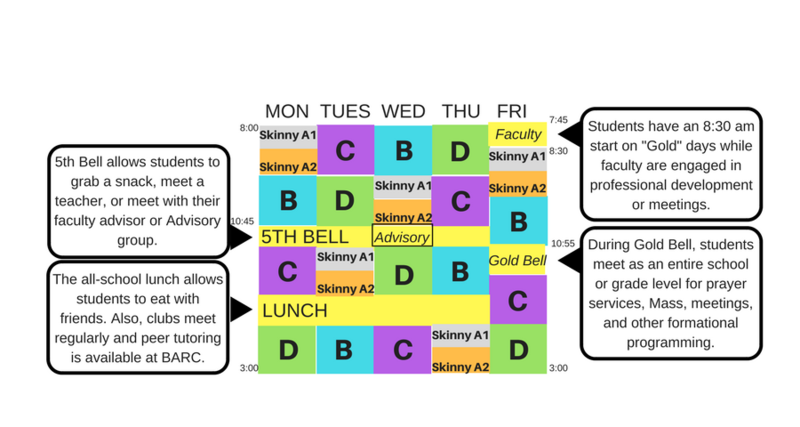 Unlike an A/B block schedule where students take up to eight classes at a time, students in the collegiate model take the same four classes each day for a semester; then, in the next semester, take four new classes. Students are able to engage in activities that require time for high order thinking. Conducting research, making presentations, having discussions, completing a lab, and writing a paper are activities that students can complete during a longer class period. Students can take a field trip trip in the neighborhood to spots like the Krohn Conservatory, Mirror Lake in Eden Park, The Cincinnati Art Museum, or Playhouse on the Park without impact her other classes. Taking four subjects at a time allows students to manage and master the subjects. Teachers have fewer students at any given time, so they are better able to know each student and her progress individually. Students are prepared for the length of a typical college class and the depth in which a topic is covered. Because there are no study halls or free periods, a Saint Ursula student has opportunities to take a variety of electives or pursue advanced coursework in particular disciplines. Students can accelerate their learning by taking two courses in the same disciplines in the same school year. The collegiate block schedule allows students to take these courses sequentially, not simultaneously. This is a unique feature of the collegiate block schedule. Saint Ursula Academy has modified the collegiate model to include traditional class scheduling for courses that introduce skills-based content needed for further study. These "skinny" courses, which meet for 40 minutes each day all year, include Algebra 1, first-level world languages, chorus and orchestra. Classes rotate so that students experience classes at different times of the day throughout the week.